From the Juan Santamaria Airport in San Jose, guests should proceed toward the Pacific Coast and follow signs toward Jaco, Manuel Antonio and Quepos. When arriving at the town of Quepos, follow signs to Manuel Antonio. Drive through the town of Quepos and the road will start climbing the hill up to Manuel Antonio. As the road crests the mountain, it then begins descending to the beach. When they get close to the bottom of the hill and the beach, guests should keep an eye out for Karahe sign on the right, and then the Jungle Beach Hotel on the left. The EOC is diagonally in front of the Jungle Beach Hotel on the right side of the road. Visitors should look for the small EOC sign at the top of the driveway on their righthand side and they will see a large green gate! At the luxury tree-top villas in the Espadilla Ocean Club, Manuel Antonio’s only beachfront, guests live 30 seconds from the renown beaches of Manuel Antonio and 5 minutes from its famous national park! Guests can enjoy a morning coffee while watching the Titi monkeys play overhead, a refreshing splash in the private pool under the canopy of the mango and almond trees, a tour in the mangroves or on the dark, sandy beaches, and an exotic meal from a private chef with foods from the land and sea. 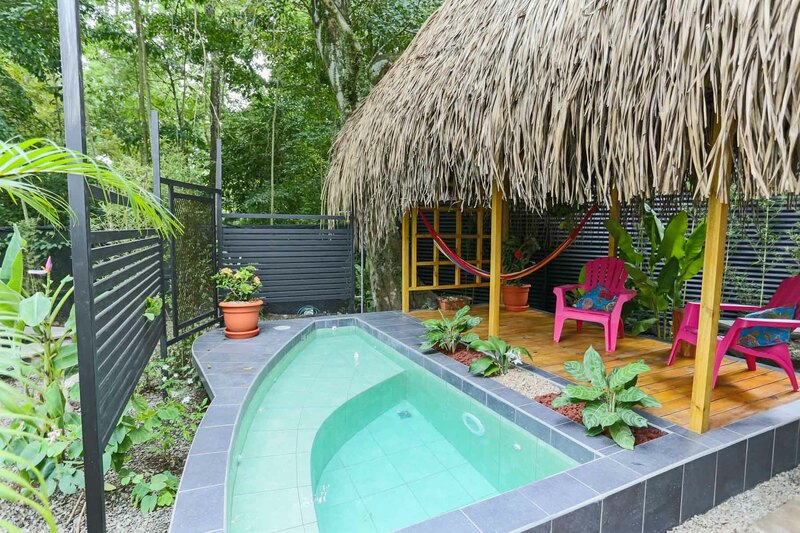 Upon exploring the surroundings of this property, you can be lucky enough to stumble upon a sloth crossing the road, or see wild toucans in the thick, humid forests of Costa Rica. The 2 bedroom, 2 bath luxury, modern villas offer daily maid service, A/C, memory foam mattresses, Wi-Fi internet, full kitchen, raindrop showers and beachfront pools. From excursions to the Farmer's Markets to river tubing, there are a wide array of activities visitors can choose to participate in. There is a personal concierge to tend to guests' needs to ensure full rest and relaxation during their stay. It’s a perfect retreat for families, couples and groups wanting a unique and diverse getaway. The four villas, Fire, Water, Earth, and Air, are located on a quaint beachfront property with plenty of privacy and security. Each villa has a king bed, a queen and a single as well as high quality bedsheets and bedside lights. The Villa has use of two full bathrooms as well as an outside shower. They also have a fully equiped kitchen, a living area, a deck with a thatched roof, a private pool and a small yard for guests.